Some multiplicity results for solutions of an impulsive boundary value problem are obtained under the condition of non-well-ordered upper and lower solutions. The main ideas of this paper are to associate a Leray-Schauder degree with the lower or upper solution. where , , , , , , , . Impulsive differential equations arise naturally in a wide variety of applications, such as spacecraft control, inspection processes in operations research, drug administration, and threshold theory in biology. In the past twenty years, a significant development in the theory of impulsive differential equations was seen. Many authors have studied impulsive differential equations using a variety of methods (see [1–5] and the references therein). where , and are two linear operators, , are constants. In  Guo first obtained a comparison result, and then, by establishing two increasing and decreasing sequences, he proved an existence result for maximal and minimal solutions of the PBVP (1.2) in the ordered interval defined by the lower and upper solutions. where , , . In , we made the following assumption. Let the function be for . In , we proved the following theorem (see, [15, Theorem 3.4]). for some . Then the three-point boundary value problem (1.4) has at least six solutions . Theorem 1.1 establishes the existence of at least six solutions of the three-point boundary value problem (1.4) only under the condition of two pairs of strict lower and upper solutions. 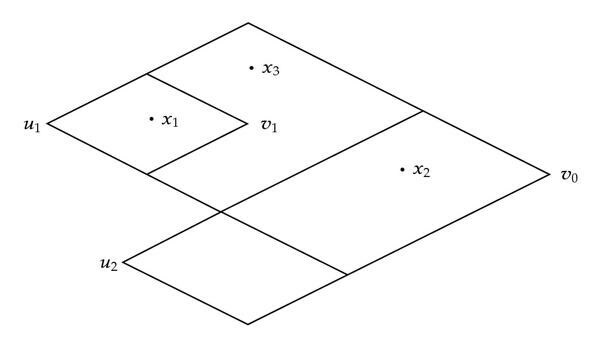 The positions of and six solutions in Theorem 1.1 can be illustrated roughly by Figure 1. 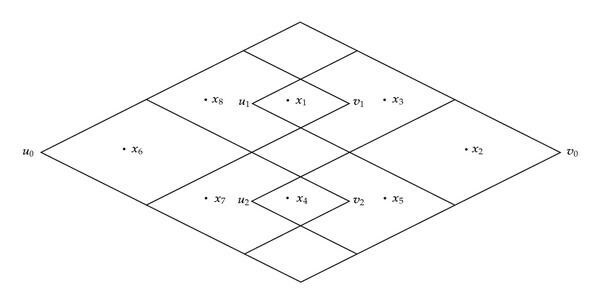 The positions of and six solutions in Theorem 1. 1. In some sense, we can say that these two pairs of lower and upper solutions are parallel to each other. The position of these two pairs of lower and upper solutions is sharply different from that of the lower and upper solutions of the main results in [14, 16, 17]. The technique to prove our main results of  is to use the fixed-point index of some increasing operator with respect to some closed convex sets, which are translations of some special cones (see , of ). This paper is a continuation of the paper . The aim of this paper is to study the multiplicity of solutions of the impulsive boundary value problem (1.1) under the conditions of non-well-ordered upper and lower solutions. In this paper, we will permit the presence of impulses and the first derivative. The main ideas of this paper are to associate a Leray-Schauder degree with the lower or upper solution. We will give some multiplicity results for at least eight solutions. 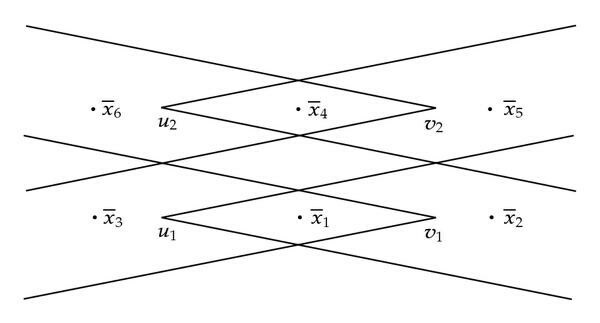 To obtain this multiplicity result, an additional pair of lower and upper solutions is needed, that is, we will employ a condition of three pairs of lower and upper solutions. The position of these three pairs of lower and upper solutions will be illustrated in Remark 2.16.
where and . Then, is a real Banach space with the norm . The function is called a solution of the boundary value problem (1.1) if it satisfies all the equalities of (1.1). Now, for convenience, we make the following assumptions. whenever for each and , for each . and whenever for each and , for each . From [18, Lemma 5.4.1], we have the following lemma. is a relative compact set if and only if for all , and are uniformly bounded on and equicontinuous on each , where . The following lemma can be easily proved. The equality (2.13) now follows from (2.14) and (2.16). On the other hand, if satisfies (2.13), by direct computation, we can easily show that satisfies (2.12). The proof is complete. From Lemma 2.5, is a completely continuous operator. We only prove the case when or for some and some . The conclusion is achieved in four steps. To begin, we show that for all . Suppose not, then there exists such that . Set for . There are a number of cases to consider. (3B) there exists such that . while for each . Therefore, we can use the same method as in case (4) to obtain a contradiction. From the discussions of (1)–(5), we see that for . Similarly, we can prove that for . Thus, (2.33) holds. Next, we prove that . If the inequality does not hold, then either there exists such that or there exists such that . Set for . Then, we have either or for some . Essentially the same reasoning as in (1)–(5) above yields a contradiction. Thus, . Similarly, . Consequently, (2.31) holds. (II)there exists such that . which is a contradiction. Thus, (2.32) holds. Thus, has at least one fixed point . Since , then there exist such that and . The proof is complete. Theorem 2.10 is a partial generalization of the main results of [16, Theorem 2.2]. Here, we do not need to assume that satisfies . The position of in Theorem 2.10 can be illustrated roughly by Figure 2. The position of in Theorem 2. 10. The relationship of is different from that of [12, Theorems 9 and 10]. Similarly, we have the following result. From Theorems 2.10 and 2.14, we have the following Theorem 2.15. Suppose that , hold, are three strict lower solutions of (1.1), are three strict upper solutions of (1.1), , , for some , and?? satisfies Nagumo conditions with respect to . Moreover, the strict lower solutions and the strict upper solutions are well ordered whenever or for some and some . Then, (1.1) has at least eight solutions. Also (1.1) has at least one solution such that and for some . It is easy to see that are distinct eight solutions of (1.1). The proof is complete. The position of in Theorem 2.15 can be illustrated roughly by Figure 3. The position of in Theorem 2. 15. In this section, we will use the following assumptions. Suppose that are two strict lower solutions, are two strict upper solutions of (1.1), , , and for some . Recently, this multipoint boundary value problem has been studied by many authors, see [16, 17, 19–21] and the references therein. The goal of this section is to prove some multiplicity results for (3.2) using the condition of two pairs of strict upper and lower solutions. As we can see from , some bounding condition on the nonlinear term is needed. Instead of the space , in this section we will use the space . First, we have the following theorem. for some . Then, (3.2) has at least eight solutions. It is easy to see that and for each . Thus, for each , and therefore, , for . On the other hand, from (3.5), it is easy to see that is a strict upper solution of (1.1). Similarly, we can show the existence of . Then, by Theorem 2.15, the conclusion holds. Obviously, the condition (3.3) is restrictive. In the following, we will make use of a weaker condition. We study the multiplicity of solutions of (3.2) under a Nagumo-Knobloch-Schmitt condition. For this kind of bounding condition, the reader is referred to . Then, (3.2) has at least eight solutions. From (3.13)–(3.18), we see that are eight solutions of (3.2). The proof is complete. We also can replace (3.3) by other bounding conditions, see . To end this paper, we point out that the results of this paper can be applied to study the multiplicity of radial solutions of elliptic differential equation in an annulus with impulses at some radii. This paper is supported by Natural Science Foundation of Jiangsu Education Committee (04KJB110138) and China Postdoctoral Science Foundation (2005037712).